Hobo Beans are actually nothing more or less than maple flavored jelly beans. Now, I love jelly beans. I also love maple candy. A combination of the two would have to be delightful, right? Well, not quite. Mind you, I’m not saying these are horrible, they just aren’t… you know… good. Oh, sure, they smell like maple when you first rip off the plastic wrap, but when it comes to taste they fall far short. The closest they come to maple flavor is a vague sense of almost maple-ness – which isn’t surprising considering the source of the flavor, according to the ingredient list: “artificial maple flavor.” Yeah, no kidding! Instead of sporting any one specific flavor, these have more of a general sweetness followed by a strange tartness that comes through after chewing and right before swallowing. I can’t say I’ll be rushing out to buy these any time soon, but I do have to admit that the mini can they come in is pretty cute. If you’re a tin/can fan, then by all means grab one for your collection… but forgo the beans themselves. Of course, I’m sure your friendly neighborhood Hobo would probably appreciate them greatly! 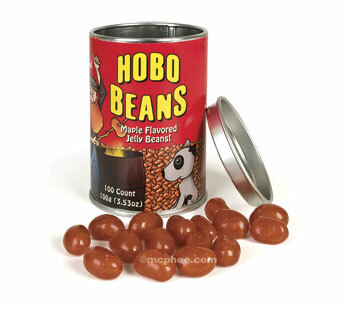 If I see these I still might get some, just because I get a bang out of the fact they actually called these Hobo Beans. I haven’t heard of the gummi haggis though. I totally agree – they SMELL like maple, but don’t taste maple at all. These look so cute! Too bad the time was spent in design instead of taste.